I want to ask you a question, an important question. One I would like you to give some thought. 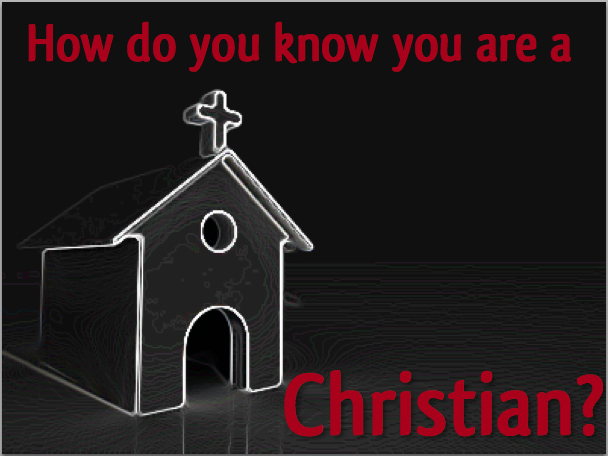 Here it is: How do you know you are a Christian? Do you say you are Christian because you walked the isle one day and prayed with the pastor at the front of the church? Maybe you say you are a Christian because you confessed Christ as your Savior at a youth retreat while you were “high” on the Christian life. Or just maybe you walked down to the front at a Crusade along with 7,000 other people. Before I go on, I am not saying that you are not a Christian because you were saved at the front of the church, on a youth retreat, or at a crusade. What I am trying to get across is that these experiences alone do not make you a Christian. There are many people who claim to be something because they participate in an activity with those who are in reality genuine. For instance, if I told you I am a minor league baseball player, you might believe me, that is until you ask me when I am playing next. That is where my logic would break down because I would explain to you that I am a minor league baseball player because I trained with the local minor league team once at a kids baseball camp. As you heard me explain how I wore their uniforms and played in a game and how that made me a minor league baseball player, you would soon realize I was not what I claim to be, and you would begin thinking my logic was a little off. Just as it is logically incoherent for me to think I am a minor league baseball player because I once hung out with the players and trained with them at a kids camp, it is equally as illogical that we think we are Christians because we once, or currently, hung around those who are Christians, attended church, or even walked the isle. He says, “Not everyone who says to me, Lord, Lord, will enter the kingdom of heaven, but the one who does the will of my Father who is in heaven. On that day many will say to me, Lord, Lord, did we not prophesy in your name, and cast out demons in your name, and do many mighty works in your name?” But Jesus will turn to those and say, “I never knew you, depart from me, you workers of lawlessness.” (Matt. 7:21-23). If we can think we are a Christian, and not be a Christian, how do we know that we are a Christian? “It is true that we need to make a onetime decision to follow Jesus. But a true onetime decision is followed by the everyday decision to follow Jesus” (23). With that in mind, I want to provide you with five additional ways McKinley gives that show we are true followers of Jesus (39). You’re not a Christian just because you like Jesus. You must believe Jesus is your Savior (John 3:16-18, 36; Romans 3:21-25; Hebrews 11:6). You’re not a Christian if you enjoy sin (Romans 6:1-14; 1 Peter 1:13-21; Galatians 5:19-21; 1 John 3:4-10). You’re not a Christian if you don’t persist in the faith (Philippians 3:12-16; Hebrews 12:1; Romans 8:38-39). You’re not a Christian if you don’t have care and concern for other people (John 13:34-35; 1 John 2:9-11). You’re not a Christian if the things of the world are more valuable to you than God (Luke 18:18-25; 1 John 2:15-17). This week I would like you to think through your answer for why you are a Christian. Considering these questions: Have you made Christ your Savior, not just your friend? Do you see a willingness to repent of the sins in your life or are you content in your sins, not wanting to repent and rid them out of your life? Have you persevered in the Christian faith for many years, or do you find yourself living for Christ only when it is the cool thing to do? Since you professed Christ as your Savior have you noticed a love for other people? Are you willing to sacrifice your time, energy, and money to help them? Do you love the world? Are you willing to sacrifice your stuff for God, or are you chasing after worldly possessions more than you are seeking God? Do you skip church on Sunday because you need to go into the office to do some work because time is money? Your answers to these questions will either assure you of your Christian faith, or they will show you that your faith is not real. I pray God will reveal to you the answer because your eternal destiny hangs in the balance. Community: Why is it important? Excellent post… and dead on. Softening the only acceptable biblical response to the Gospel, often for the purpose of simply drawing crowds, has created a mass of confusion that we will probably not see clarified anytime soon. But thanks for faithfully proclaiming the truth… the true Gospel and the credible evidences of the power of the Gospel to change lives. God bless. Thanks for your encouragement. I agree wholeheartedly with your assessment of today’s church. Challenging those who call themselves Christians is one thing we all must be willing to do. But sadly the church is not willing to do it because they do not want to lose attenders or offend anyone. Thanks for your likemindedness.